Significant snow in New England every winter is about as certain as sun in Florida every summer. When I moved to the USA from the south of (old) England to do my medical residency in Maryland, my first few years living in the United States were relatively snow-free. But when I started my first job as an Attending physician in central Massachusetts, I was in for a big shock. I had never yet shoveled snow in my life, but soon realized it was a rite of passage every winter in this part of the world. Having now lived here for the last several years, I've become as used to it as all the seasoned New Englander's around me. Every winter the heavy snow invariably comes, and every winter I'm always impressed by how quickly towns and cities work to prepare beforehand and rush to clear the roads in lightning quick time afterwards. 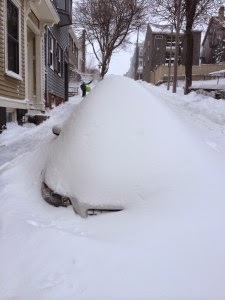 The large snow blizzards this winter, followed by more—again showed the importance of preparation for any big task (see the above picture of my car buried in the snow, the roads around it quickly cleared by the Boston snow plows within a couple of hours). Hundreds of trucks stood ready and hundreds of emergency personnel were drafted in for the clean-up efforts. And sticking with this theme of winter, speaking as a doctor who has worked in a lot of different hospitals in the Northeast, I believe that hospitals can learn an awful lot from how towns and cities prepare for snowstorms. The typical scenario for hospitals goes something like this: winter comes and thousands more people fall sick: coughs, colds, pneumonias, and of course the dreaded flu. For the already sick and frail, it doesn't take much to push them over the edge to the point where they need a hospitalization. It happens every winter across the country, resulting in hospitals experiencing a “surge” of patients. Yet still every winter, many hospitals are taken off guard and struggle to cope with the increased need. Resources and staff are stretched, and ultimately patients have to wait longer for much needed services. • planning to reduce the volume of elective cases such as orthopedic surgeries during winter months in order to free up beds for other medical cases.